Kildare boxer Dennis Hogan was denied a world title following a highly controversial defeat to Jaime Munguia in Mexico. 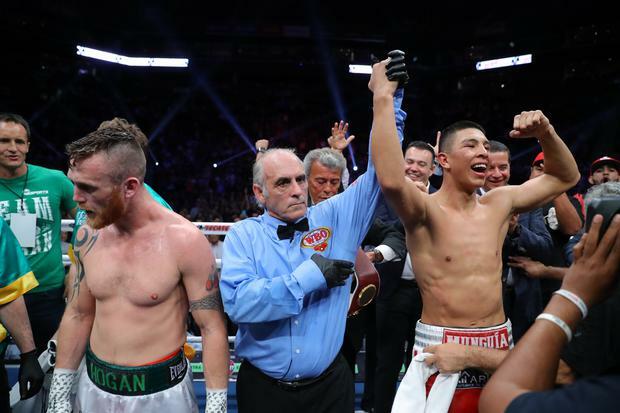 Hogan looked to have done enough to win the WBO Super Welterweight title in Monterrey, but to the surprise of most observers Munguia won a majority decision after the judges returned scorecards of 115-113, 116-112 and 114-114. Hogan, who is based in Australia, entered the bout with a 28-1-1 record and speaking on TV after the fight, he expressed his devastation with the contentious result. "I felt so confident," Hogan said after the fight. Munguia claimed afterwards that he felt he 'definitely' won the fight, but then offered Hogan a rematch - even saying that he will fight the Kildare boxer in Australia. "They offered us one [a rematch] straight away," Hogan said.